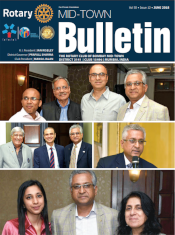 As we enter into the final month of the Rotary year 2017-18, I realise that this is the last time I will be penning this column. Let me start off by saying that I’ve had an exciting year filled with great experiences and learning’s about Rotary. I have connected with so many fellow members like never before and deepened several existing friendships here in our Club. Not to mention the new friendships made outside, thanks to the District events. I take this opportunity to thank each and every one of my fellow members for the co-operation, support, love and respect extended to me during the year. I also would like to apologise for any mistakes or slights that I may have incurred, but would like to assure that they were absolutely unintended. President Elect Dr. Deepak Garg is on a mission to get a grip of his responsibilities starting soon and we have had a few meetings to that effect, working towards a seamless transition. Coming back to the eventful month of May, we had organised a very interesting visit to the Bombay High Court Museum on Saturday, the 5th. Lawyer, historian and curator of the museum, Mr. Rajan Jayakar, who was also a speaker at our Club in April, personally took our group of about a dozen Rotarians around the Museum. Throughout the visit, which lasted for over two hours, Jayakar kept us engrossed by recounting the history of evolution of judiciary in Bombay that started around the 12th century. On 6th May, many of us visited Potakhal-Baste villages to inaugurate the Water Grid Supply Project, an initiative of our Rotary Club to ease the lives of villagers, especially the women.